The Glen Tarsan is one of a trio of vessels -- soon to be four with the addition of a new ship launching in 2019 -- in The Majestic Line's fleet. 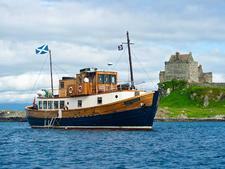 Finished in traditional wood and brass, and topped by a varnished wooden wheelhouse, the Glen Tarsan has an attractive, old-style feel. At 85ft in length, and with a crew of four, the small ship entered service in 2007 after being converted from an Irish fishing boat. It has six cabins, however two double cabins are reserved for single occupancy at no supplement; hence the maximum number of passengers is 11 on any cruise. There are two cabins on main deck as well as four cabins on lower deck. The two on main deck have a window that can open; the four cabins on lower deck have portholes that do not open. Beds are either twin or king-size and each is dressed with freshly laundered duvets, a pile of pillows and tartan rugs for extra warmth. There is a small wardrobe, plus limited storage space under the beds. Each cabin has a very small shower room with a toilet and washbasin. Life on board Glen Tarsan centres on the saloon -- which doubles as the lounge and dining room -- and guests dine communally at a long table. Days begin with a substantial breakfast, followed by a lighter lunch. The evening meal is a daily highlight and a more formal affair with the dining table laid out in style. High quality dishes feature fresh, locally sourced ingredients that reflect the best of Scottish fare. Complimentary wines -- again excellent -- are served with dinner and other drinks are available from the reasonably priced bar list. Water and soft drinks are freely available throughout the day, and crew members serve tea and coffee on request. If passengers are not out on excursions there is also morning coffee and afternoon tea with home-made cakes. There are also three outside areas where passengers can relax. A small wooden deck set out with a table and chairs is situated aft of the saloon, there is a bench on the compact fore deck and traditional wooden sunloungers on the top deck. Due to the ship's size, each cruise provides passengers with the opportunity to get to remote places that are inaccessible to larger cruise ships and itineraries take in Argyle's coastline, the Inner Hebrides and the Western Isles. 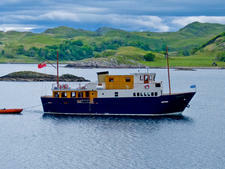 Glen Tarsan undertakes three- and six-night sailings to the Inner Hebrides and Argyll from the port of Oban and the season lasts from early April to late October.